Long ago, I learnt (to my cost) that trailers lie, they are not our friends. What looks like a thrilling, suspenseful film can turn out to be a sluggish, bore fest. What looks like the comedy of the year barely raises a chortle. However, this knowledge has not stopped me from falling prey to their charms. For example, last year, the trailer for Illumination animation, The Secret Life Of Pets, got me pretty hyped - only to find myself bitterly disappointed by the film itself. As a result, I didn’t trust the trailer for Sing. Yes it looked like fun, yes I love Son of Rambow, Sing director Garth Jennings’ previous film, but I’ve been burnt before and now I have trust issues. So, it was with wary expectations that I went to watch Sing… and I loved every minute. I couldn’t help but fell in love with plucky koala, Buster Moon (voiced by Matthew McConaughey), and his endearing, Muppet-like attempt to save his beloved theatre. Thankfully, Sing is more than just X Factor with animals. Indeed, the vast majority of the film is focused on the hectic lives of a number of key characters - an exhausted and underappreciated pig (Reese Witherspoon), a punk-rock teenage porcupine (Scarlett Johansson), a shy elephant with a big voice (Tori Kelly), an arrogant mouse (Seth MacFarlane) and a gorilla (Taron Egerton) who desperately wants to break free from his family’s criminal activities. Jennings’ film whizzes between each of these characters, barely giving his audience time to breathe. Despite the large number of competing narratives, Sing retains its focus - its uplifting ‘believe in yourself’ message remains clear (the jokes save Sing from feeling too schmaltzy). However, the real joy and undeniable entertainment of Sing lies in its music. There are some 84 songs in this movie (ranging from audition snippets to full blown musical numbers) from a wide variety of artists. 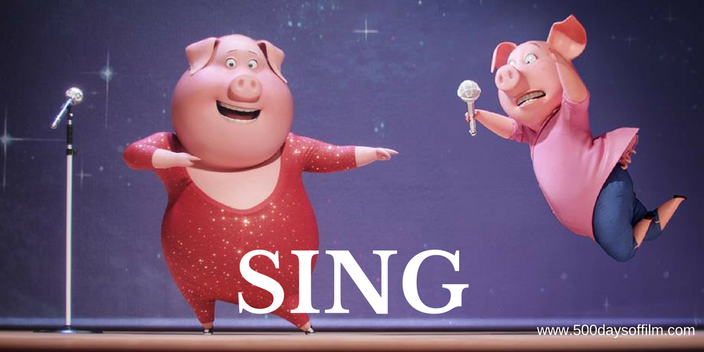 Sing is ridiculously, foot-tappingly infectious fun - perhaps I should trust film trailers after all*. If you have, what did you think of the latest animation from Illumination? Let me know in the comments section below!